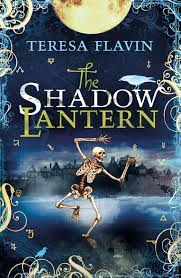 The Shadow Lantern, by Teresa Flavin (Templar July 2014, upper middle grade, moving YA-ward), is the third book about two young teenagers, Sunni and Blaise, who slip into the pasts shown in the magical paintings of the Renaissance artist Fausto Corvo. In this book, a travelling showman comes to town, with a shadow lantern--an antique slide projector-- and three glass slides hand-painted by Corvo himself. Like Corvo's other paintings, the slides are magical portals through which Sunni and Blaise can pass, and long as the oil lamp illuminating the images stays lit, they can explore at their leisure. At first it seems safe enough--simple sight-seeing trips to Venice, Prague, and Amsterdam of four hundred and a bit years ago. But it turns out that the slides hold the clues that lead to the most magical of Corvo's paintings....paintings that his old enemy, Sorenzo, trapped in the world of the paintings, is still determined to find. I enjoyed the first two books just fine (here's my review of The Crimson Shard, the second book), and this third one also. They're good reading for those who like fantasy and magic that's tasty for the mind--it's not fantasy with swords and spells and epicness of all sorts, but more an intellectually pleasing expedition that intrigues through the true strangeness of the vistas it offers (not sure that made much sense....). The rich and detailed descriptions of the strange lands inside the paintings are incredibly vivid, and the books are worth reading for that part of the journey alone. And although Sunni and Blaise don't actually Do a whole heck of a lot (especially in this third book), they are perfectly reasonable companions for the reader, and it was nice to see their relationships develop. The time travel in The Shadow Lantern is primarily tourism to the past...but because Fausto Corvo created the slides as a pathway to finding his pictures, there's a bit more point to it. That being said, once the slide of Amsterdam becomes subsumed by The Mariner's Return, it really reads more like a portal fantasy than time travel. Time travel through paintings isn't as common a plot device as one might think (or I'm just reading the wrong books). Apart from this series, the only example I can think of is the Mary Poppins story (in Mary Poppins Comes Back, I think) where Jane goes into the world painted on a china plate....It's a lovely, enchanting premis--portal fantasy mixed with time travel!-- and I'd love to know of more examples. Charlie Bone, in Jenny Nimmo's Children of the Red King series, travels through paintings. I'm not positive, but I think I remember that some of his travels are through time as well as space.